It was also known as the DB-7 (Douglas Bomber 7) and as the Boston or Ranger to the British. It was said to be easy to fly with good handling characteristics during takeoff and landing. It represented an advance in flight control systems with light handling during high-speed flight, with no overbalance on small control inputs. The tricycle landing gear made takeoff, landing and ground handling very simple and pilots were able to fly it with a minimum of instructions. It also provided a stable gun platform for night-fighter missions. Handling with one engine out was also said to be very satisfactory, although the prototype crashed while simulating an engine-out procedure.2 It was very durable and was able to withstand extreme battle damage and found a role in every combat theater of the war. It was a "pilot's airplane". The Soviets were the largest operator of the Havoc. • 1,200 lb bomb load. • Operating speed in excess of 200 mph. A Boston I equipped with a 2,700 million candlepower Turbinlite. There were several variants of the Havoc. The Boston I was powered by two Pratt & Whitney R-1830 engines and was completely equipped to French specifications. All instruments were metric and the radios were not compatible with the British system and it could not accommodate British bombs. The throttle system also operated in the opposite direction of the British and American system and had to be reconfigured. Its high speed was its only asset and it was equipped as a night fighter with eight 0.30 caliber machines guns mounted in the nose. They were assigned to the No. 23 Squadron and a number of aircraft were equipped as Turbinlite squadrons with a 2,700 million candlepower searchlight in the nose. The Turbinlite was not a success as it gave away the position of the aircraft and it was replaced with Aircraft Interceptor (AI) radar equipped Beaufighter and Mosquito night fighters in early 1943. Havoc IIs were French DB-7As converted to night fighters. A solid nose housed twelve 0.303 caliber machine guns and was fitted with AI radar. Thirty-nine Havoc IIs were fitted with the Turbinlite, but without armament. All DB-7 versions were known to the British as the Boston. The British later converted their Bostons to radar equipped night-fighters and theses were collectively known as Havoc Is. The USAAF referred to the plane as the A-20 Havoc, and the reconnaissance version as the F-3. The Boston III (DB-7B) was the first batch to be ordered directly for the RAF. It was a pleasant surprise to the British crews who had been operating Bristol Blenheims.8 It was twice as powerful and carried twice the load and was a very strong reliable aircraft—it was also 80 mph faster. If an engine was lost on takeoff, control was considered outstanding with one-engine performance, unlike the Lockheed P-38 Lightning and Martin B-26 Marauder which took much experience to maintain control on one engine. 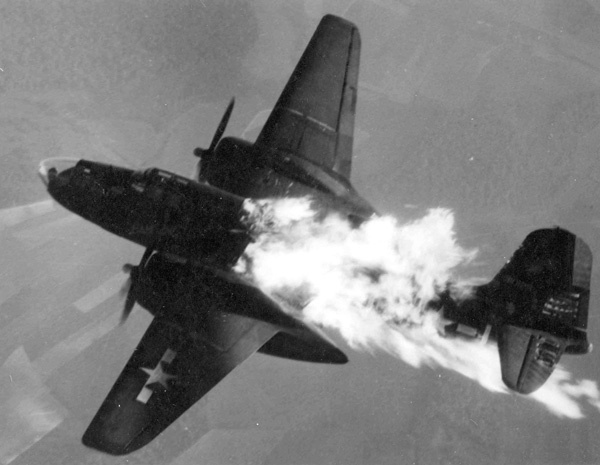 An American A-20 Havoc bursts into flames after taking a direct hit from flak. 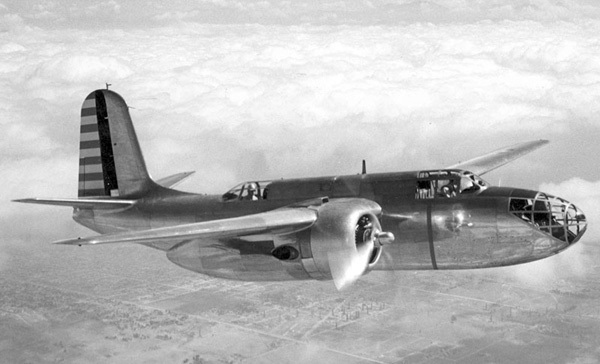 The A-20B was powered the same as the A model and had a modified Plexiglas nose. Bombs racks were changed from a vertical to horizontal configuration and the bomb bay could house a 200 gallon (750 liters) fuel tank for ferrying purposes. Two 0.50 caliber machine guns were mounted in the forward fuselage, one 0.50 was placed in the open dorsal position and one 0.30 was mounted in the ventral position. A field modification replaced the plastic nose with a solid nose, which housed four to six 0.50 caliber machine guns. 999 A-20Bs were built at the Douglas plant in Long Beach, California. Six A-20Bs were transferred to the US Navy and designated BD-2s. The A-20G variant was built in greater numbers than any other version. It had a solid nose, which housed a battery of guns. They were powered by two Wright R-2600 engines and a total of 2,850 aircraft were built at Santa Monica. Other changes were the addition of carburetor heat, heavier armor plating, and removal of the dual controls in the gunner’s compartment. The A-20G-1 nose contained four 20-mm cannons, one 0.50 caliber machine gun in the dorsal position, one 0.30 caliber machine gun in the ventral position and 2,000 lbs of bombs internally. The A-20G-5 replaced the nose cannons with six 0.50 caliber machine guns, but were found to be less accurate. Starting with the 751st aircraft in the series, the A-20G-20 replaced the dorsal machine gun with a Martin turret with twin 0.50 machine guns and twin 0.50s were placed in the ventral position. Bomb racks were also added to carry 500 lbs of bombs beneath the outer wing panels. Visibility for the Havoc was good from the cockpit and stall characteristics were considered docile and it handled very well during low flying operations. During evaluations, it was found that the Spitfire V could only keep up with it for only a few minutes before overheating, but the Bristol Beaufighter was said to be slightly faster. Not being perfect, there were some complaints. The takeoff speed was 100 mph, so the airplane required a lot of runway, and the flaps operated too slowly and were not very effective making it difficult to land on grass airfields, leading to accidents caused by skidding. Dual controls were located in the aft gunner’s compartment, but were said to be of little use. The dual controls were eliminated on the A-20G. 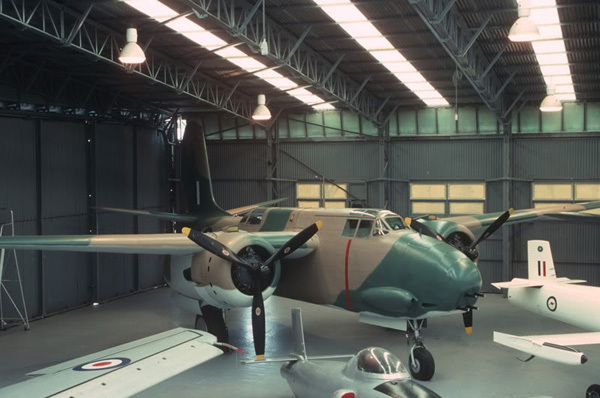 A Boston III on display at the RAAF Museum at Point Cook, Australia. It is the last survivor of the 69 Bostons that served with the RAAF. Almost one year after the French had taken delivery of their DB-7s, A-20A Havocs were delivered to the USAAC/USAAF and were operated by the 3rd Bombardment Group at Savannah Georgia. 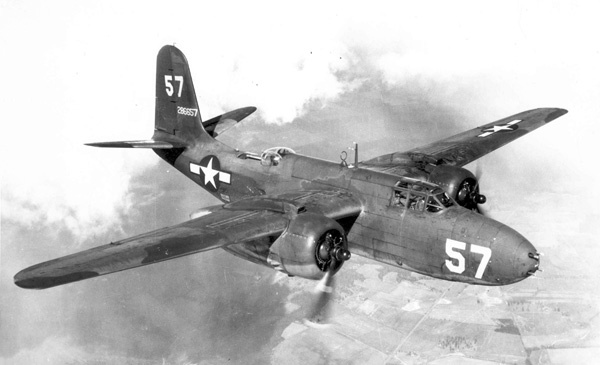 Additional aircraft were provided for the 27th Bombardment Group. Initially, the engines suffered from overheating and after modifications were made to improve engine cooling, pilots were reporting good results. They performed training exercises in Shreveport, Louisiana in September 1941 and shortly afterwards, the aircraft was officially designated the Havoc. The 58th Bombardment Group received Havocs at Hickman Field, Hawaii but two were destroyed at the raid on Pearl Harbor of December 7, 1941. The first Havocs to perform bombing missions in the Pacific were operated by the 3rd and 89th Bombardment Group and began operations on August 3, 1942 from Port Moresby, New Guinea. They were later joined by the 312th and 417th Bombardment Groups and by September 1944, the Fifth Air Force had a peak inventory of 370 Havocs. By the war’s end, all three groups were operating with A-20Gs. The majority of aircraft were used in low-level missions and some aircraft were equipped with three-cluster bazooka tubes under each wing. The first planes to go into service with the RAF were Havoc Is with the No. 23 Squadron during the winter of 1940-41 in night fighter roles. They were later joined with the No 418 Squadron (RCAF) and the No. 605 Squadron with Boston IIIs. Other squadrons included the No. 25, No. 85 and No. 93. Turbinlite versions of the Havoc I, Havoc II and Boston III were operated by the Nos. 530 to 539 Squadrons. In the Western Desert and the Mediterranean, Bostons were flown by RAF Squadrons Nos. 13, 18, 55 and 114 and the Nos. 12 and 24 Squadrons of the South African Air Force (SAAF). They engaged in raids dubbed “Boston Tea Parties” and flew missions in Tunisia, Sicily and Italy. Bostons were replaced with de Havilland Mosquitoes in 1946. The No. 22 Squadron of the Royal Australian Air Force operated 69 DB-7s and A-20s against Japan. They had a variety of different versions of the Havoc from the SAAF and the Netherlands, but to the Australians, they were all known as Bostons. Operations began from Ward’s Strip in Port Moresby on November 5, 1942. The squadron was reequipped with Bristol Beaufighters after suffering their worst loss of 13 Bostons on the ground after a Japanese raid at Morotai on November 23, 1944. A surviving A-20K Havoc on display at the Museu Aerospespacial in Brazil. 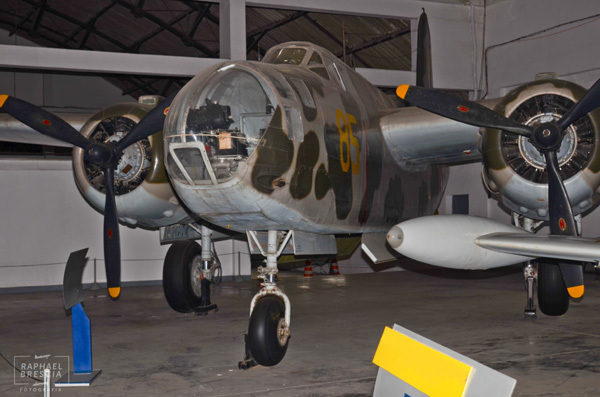 The final foreign recipient of the Havoc was the Força Aérea Brasileira, which received 30 SAAF A20G to A-20K Havocs in 1944-45. They saw very little service and one A-20K is on display at the Museu Aerospespacial in Brazil. More than 3,600 havocs were sent to Russia under lend-lease, which was almost twice that sent to the British, and substantially more than the 1,962 aircraft delivered to the USAAF. 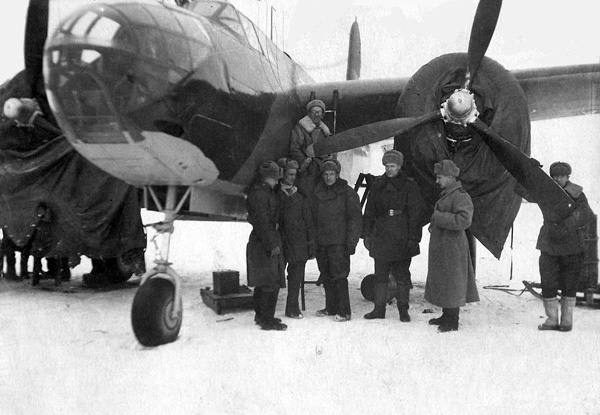 The majority of the aircraft delivered to the Soviets were A-20s, but records indicate that 20 aircraft were DB-7Bs. Production ended on September 20, 1944 with total of 7,098 Havocs built by Douglas and an additional 380 built by Boeing. By the time of V-E Day, all USAAF A-20 Havocs were replaced with A-26 Invaders and the British Bostons were replaced with de Havilland Mosquitoes. At the end of the war, most Havocs were scrapped and by the early 1960s, only six complete airframes were known to be in existence. Recently, more Havocs have been discovered at crash sites in Russia and the jungles of New Guinea and are undergoing restoration. Eight 0.30 caliber machine guns. 2,000 lb (900 kg) bombs in an internal bay. Nine 0.50 caliber machine guns. 4,000 lb (1,800 kg) bombs in an internal bay. 1. René J Francillon. McDonnell Douglas Since 1920: Volume I Annapolis, Maryland: Naval Institute Press, 1988. 293. 2. Harry Gann. Aircraft in Profile, Volume 9. Garden City, New York: Doubleday & Company, Inc., 1971. 254-256. 3. E. R. Johnson. Havoc. Aviation History. September 2004. 23. 4. David Mondey. The Concise Guide to American Aircraft of World War II. New York: Smithmark Publishers. 1996. 100. 5. William N. Hess. A-20 Havoc at War. New York: Charles Scribner's Sons, 1979. 11. 6. Enzo Angelucci and Peter Bowers. The American Fighter. Sparkford, England: Haynes Publishing Group, 1987. 185. 7. Terry M. Mays. P-38 Night Fighters in the Solomons. Aviation History. July, 2001. 29. 8. William Green. Famous Bombers of the Second World War. Garden City, New York: Doubleday & Company, Inc., 1975. 142. 9. William N. Hess. A-20 Havoc at War. New York: Charles Scribner's Sons, 1979. 143. 10. Dr. Alfred Price. Instruments of Darkness. London: Greenhill Books, 2005. 77. Created April 29, 2014. Updated August 10, 2014.